Anything that isn't chocolate, I imagine being converted into chocolate. 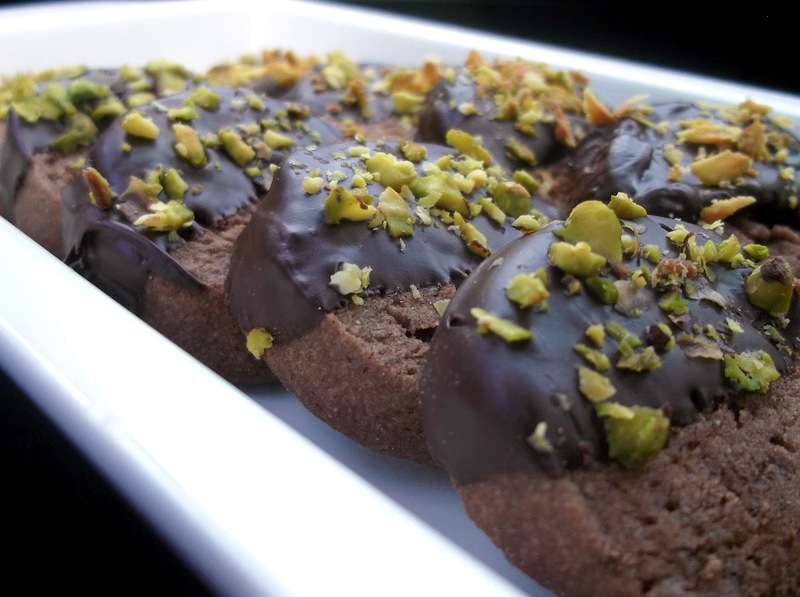 I am still on the hunt for a good chocolate pastry recipe (if you have one, hit me up! 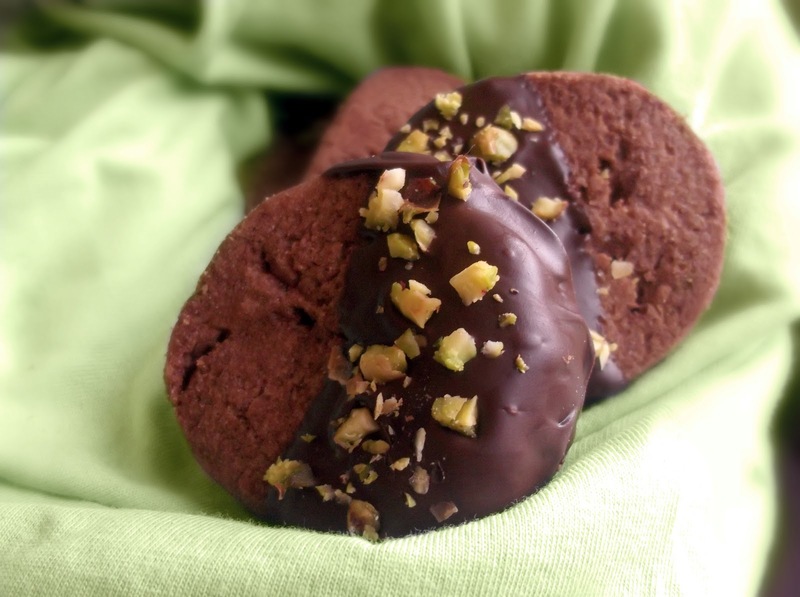 ), but recently I found a wonderful chocolate shortbread recipe and decided to coat it in chocolate and pistachio nuts for extra decadence. An absolute match made in heaven! 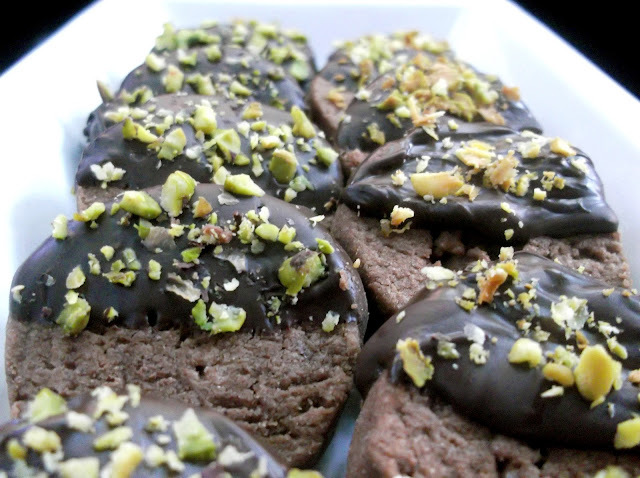 Where have pistachio nuts been all my life? It's always been one of those ingredients I have wanted to cook with and never got around to it, but it is soon to become a staple in my pantry. Preheat the oven to 150C. Grease and line two or more baking trays. In a large bowl, beat the butter and sugar together until light and fluffy. Add the vanilla and mix to combine.Sift the flour, cocoa and salt together over the butter mixture. Fold the flour in until well combined, and begins to form a dough. Form a ball from the dough and wrap in glad wrap and refrigerate for 1 hour or more. Remove from the refrigerator and sit for 10 minutes to soften slightly. Meanwhile, turn the oven on to 150C. Grease and line two or more baking trays. Prepare a flat surface with some flour, and roll the dough out to about 1/2 an inch thick. Using a cookie cutter, stamp out shapes and place on the trays until all the dough is used up. Cook for 25 minutes before removing from the oven. Cool completely on trays before removing. 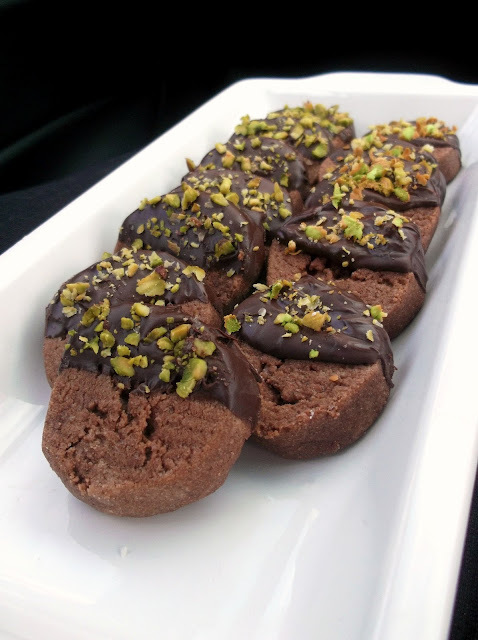 When cooled, dip in melted chocolate, and sprinkle with pistachio nuts, if desired. These looks delicious. 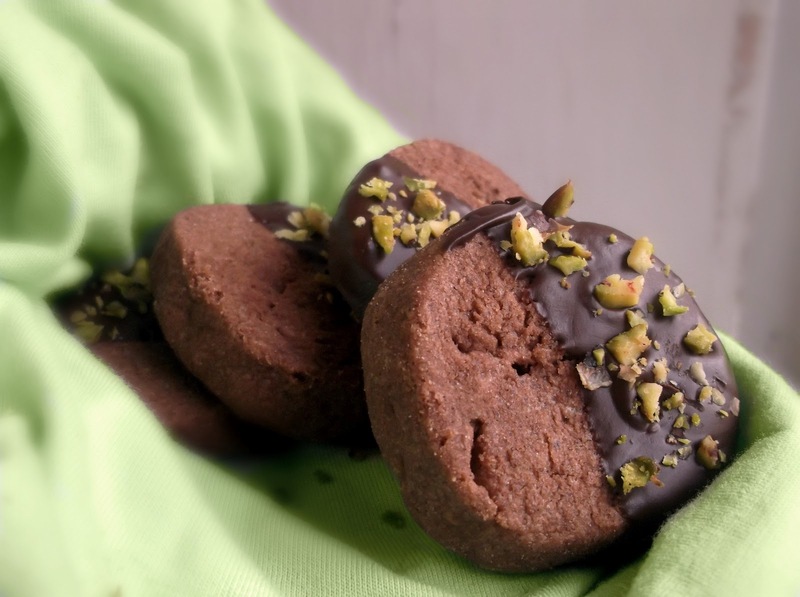 Shortbread cookies are one of my favorites and chocolate makes almost everything better. Do you mind if I pin this on Pinterest? Hi Micha, I'm glad you like the look of these, they are delicious! youre welcome to post the recipe/pictures on pinterest, no worries! We love shortbread in my house and my husband is a die hard chocoholic. I'm pretty sure these cookies will be a hit here. Hopefully will be able to try it out this week itself. Thanks for the inspiration.